Liberty Pressing Solutions' core expertise lies in presswork and the production of metal pressings for the automotive industry. The company's medium/heavy press capability is one of the largest in the UK. Presently the business has 54 presses, ranging from 10 tonnes to 800 tonnes, and manufactures primarily structural, chassis and “Body in White” metal pressings for a wide range of automotive applications and sub-assemblies. Liberty Pressing Solutions is a supplier to both OEMs and after market customers, some of which are Jaguar Land Rover, Honda, Nissan, BMW, JCB and Case New Holland. 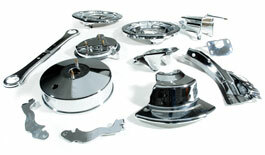 In addition, it also provides pressings for a range of customers in the general engineering sector. Liberty Pressing Solutions have the capacity to offer a quick turnaround when there is an urgent customer requirement for press relief and/or press rental work. The company's wide range of light presses include 110t and 160t progression capability for the manufacture of bracketry and smaller parts, while medium to large presses range from 200t to 800t. The business can also to offer pressed composite components in partnership with its sister company Liberty Advanced Composites through its press development hall.